Learn to use the often-overlooked rock climbing technique of directing your focus. Improve your climbing performance with this mental training tactic. Slight changes in a rock climber’s focus during a particular move or even just an element of a move can make the difference between success and failure. Not addressing this fact can lead to repeated failure to execute climbing movements properly or effectively, even if they’re within the climber’s ability level. 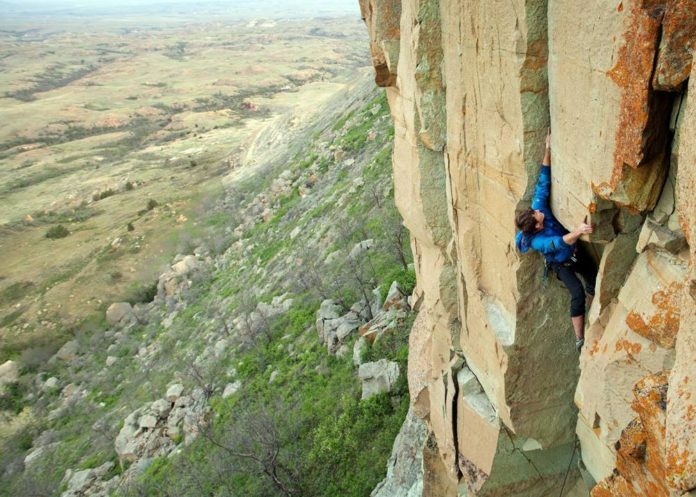 Learn how to direct your mental focus appropriately during training, and then use this mind training tactic for improved climbing performance on the rocks. 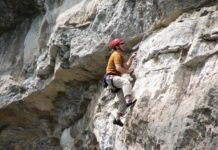 All rock climbers of all levels can likely benefit from learning how to better direct their focus on elements of climbing moves, especially when learning new and unfamiliar movements. 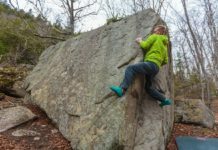 This climbing training technique exercise should top your list if you find yourself failing constantly or repetitively on the same move of a climbing route or boulder problem – or on the same type of movement from route to route. Second eyes: Ask a knowledgeable climbing partner(s) what it looks like you should be doing as opposed to what’s happening on the move. Keep this in mind as you perform the following exercise. Weight off: Start by getting into the position from which you start the move. Have a partner take some weight off by either giving some rope tension, or, if bouldering, pushing on your lower back (a “diet”). Break it down: Move slowly through the move with assistance, paying attention to the body positions and effort/contributions from various body parts required to execute the move successfully. Experiment: See what happens if you actually direct your focus on particular portions of the move with conscious, internal commands to the body parts in question. These might include telling your hand, “Pinch, pinch, pinch;” telling yourself to “breathe and relax;” commanding your core to tighten; or focusing on pushing harder with your feet and legs, among others. Wire it in: Once you’ve figured out exactly what needs to happen to execute this climbing move successfully, attempt to perform it on your own, first by itself, and then, in sequence. If necessary, wire in the conscious commands from your mind as a part of the essential beta, at least until your body can automatically perform these types of movement correctly every time without your directed focus. Dynos: Focus on pushing with your feet, especially focusing on the foot giving the dynamic motion the most power. Pay attention to driving from that foot with power, and letting that power move explosively through your body to the leading hand. Strive to transfer your focus quickly to the leading hand once you release, commanding it to close tightly on the intended target hold. Long static reaches or dynamic pops: Focus consciously on tightening the abs and core muscles to lengthen and stabilize the body as you reach for the hold. 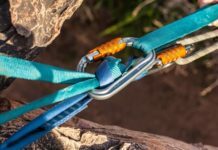 Difficult handholds: Repeating to yourself what the hand in question needs to do (i.e., “crimp, crimp, crimp; or “pinch, pinch, pinch”) keeps it on task, and also helps interrupt any distress messages about how the hold is uncomfortably poor. Easier portions of unbroken sequences: Telling yourself to breathe and relax through a climbing sequence, even if you can’t rest, can help slow down the heart rate while keeping movement fluid, muscles less tense, and breathing at a peak-enhancing pace. Then, when you reach the next difficult section, it’s easier to kick up your effort level as the route demands. 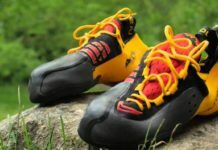 Footwork: Every foot placement should be as quiet, deliberate, and precise as possible, as explained in Climbing Techniques – Training Climbing Footwork. Strive to make directing your focus part of the process for the types of moves that you struggle with, even on your first try (onsight) attempt on a boulder problem or route. 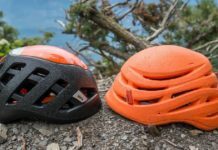 Beyond this, after you’ve made sure that you can’t find another solution to the climbing move that’s stymieing you on a boulder problem or climbing project outside, directing your focus using the above climbing exercise should be your next attempted solution. 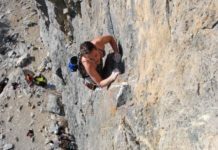 Finally, if you cannot perform a particular climbing move despite multiple problem solving attempts combined with efforts at directing your focus, it’s likely that you need to improve another area of climbing weakness to achieve the desired performance on this move.